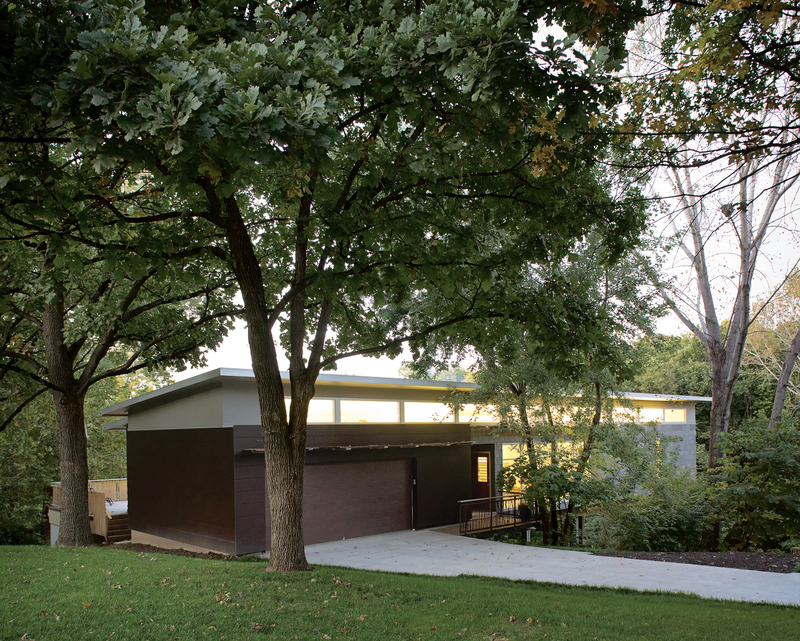 In a leafy residential area a few miles from downtown Kansas City, Missouri, an enterprising architect saw opportunity where others saw trouble. He took a sloping, triangular lot and designed a new home for his growing family—an open, tree house–like structure on stilts that hovers at the quirky edge of a conventional neighborhood. The Arnolds’ bedroom and living area float over the hillside, the large windows allowing light to flood in from both sides. A bamboo-enclosed deck sits atop the house’s foundation. The entry bridge leading to the front door was made from timber salvaged from Christian’s parents’ farm near Kingman, Kansas. Christian and Jack play chess by the fireplace - the centerpiece of the living room and which the Arnolds use daily during the winter. The hearth is made of large slabs of limestone, which Christian cut himself, intentionally leaving imperfections on the surface for texture. 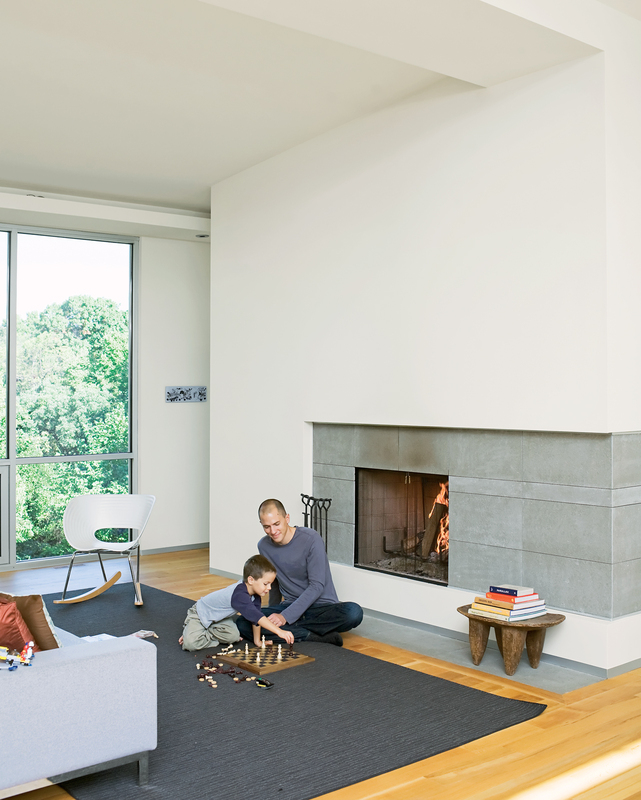 A studio8 couch and Vitra Tom Vac Rocker articulate the space. The dining table was made from reclaimed pine that Julie refinished with layers of stain and wax. Julie also made the lamps, using Knoll textiles. 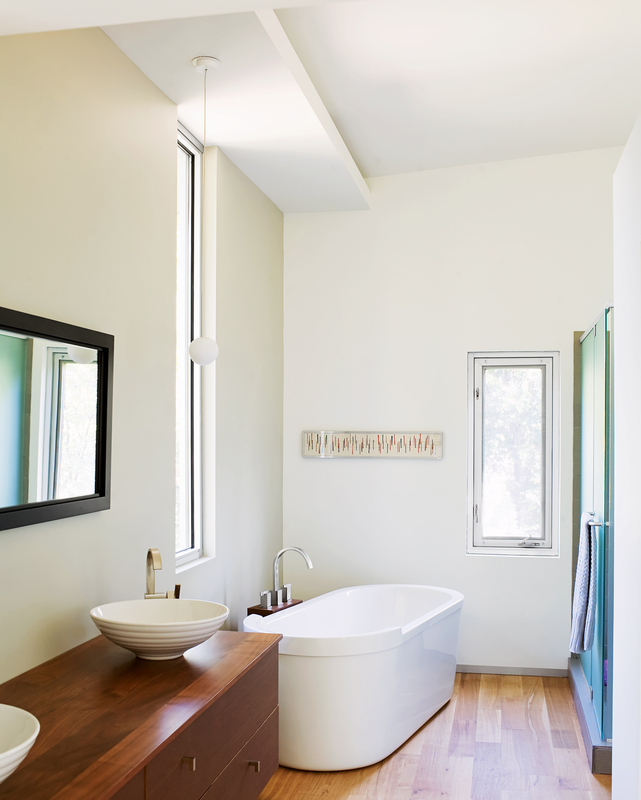 The Duravit tub in the master bathroom is another favorite spot for keeping warm; it offers a slender view out toward the trees. 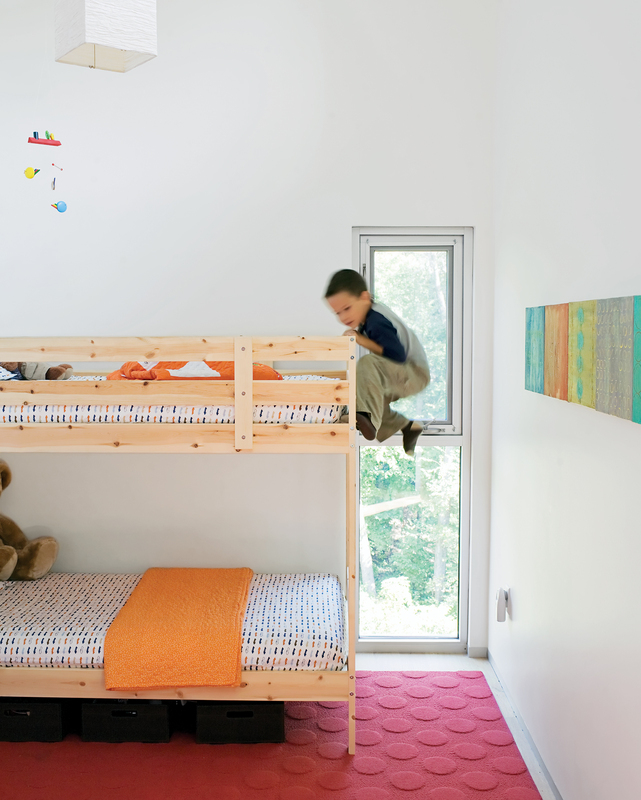 In the kids’ room, Jack climbs the bunk bed he shares with his little brother, James. The paintings on the wall were done by their mom. Julie, James, and Christian enjoy an unexpected bonus of living in a house on stilts—–a pair of swings suspended from the base of the structure. The family often goes for walks on the property, looking for wildlife and playing in the tepee they built in a secluded space in the woods. Pull up to any house in any American suburb, and the first thing you’re likely to see is the blank, flat expanse of adjoining garage doors. 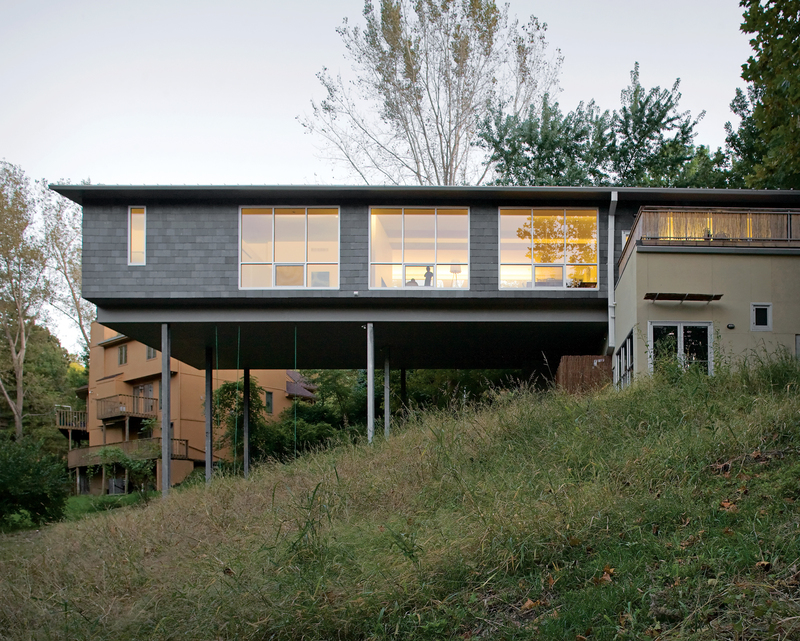 That suburban cliché was exactly what architect Christian Arnold and his wife, Julie, wanted to avoid when they built their home near downtown Kansas City, Missouri, but it’s precisely what they ended up with. “We make fun of those houses with big garage doors facing the street,” Julie says, laughing. “But we couldn’t figure out any other place for ours.” That’s one dilemma of building on an oddball piece of land where geography dictates architectural destiny. Before they had children, the couple lived in an urban neighborhood, but when their two young boys, Jack and James, entered the picture, they outgrew their 19th-century bungalow. Christian didn’t savor the idea of commuting from the suburbs to his downtown architecture firm, so the search for property in the city began. The Arnolds soon realized what so many have before: A good empty lot is hard to find. Yet despite its shape, pitch, and seemingly unbuildable proportions, the lot was perfect in other ways: It was located in the city just a short ride from downtown, yet completely enveloped by trees. It had a suburbanesque yard where the boys could climb cottonwoods and maples with their dad. Perhaps best of all, the odd lot presented an interesting design challenge for Christian. Having lived in lofts in the past, the couple wanted to create a loftlike sense of openness and flow, with lots of natural light. “I’ve gotten addicted to light,” Christian says. “It’s part of my body chemistry.” So, after throwing around ideas for a few months, he came up with drawings that called for a rectangular structure, half of which rests on a typical concrete foundation, wedged into the hillside, while the other half sits on towering steel posts planted toward the bottom of the hill. The end result feels almost like the house was miraculously pulled from an urban building and placed in a leafy yard—–an open-plan tree house on stilts. A primary goal of the project was to keep the process and the house itself as green as possible—–to “touch the earth lightly,” as Australian architect Glenn Murcutt famously says. Despite the sloping lot, no dirt was added to the site, minimizing the need to bring in exhaust-spewing trucks during the construction. Trees were left in place, providing shade for the hot summers but allowing warm sunlight indoors in the winter once the leaves have fallen. The Arnolds chose long-lasting materials like slate tiles for the house’s exterior and a recycled metal roof with an estimated 50-year life span. The construction itself yielded some materials, like extra rebar from the foundation now used as railings. With tall windows on all sides of the house, the Arnolds worried that heating and cooling bills would be very expensive, but a radiant floor heating system, along with natural light and a much-used fireplace, have kept costs down. “We haven’t changed a lightbulb since we’ve been here,” Julie notes, nearly a year after moving in. The house displays subtle nods to both Julie’s and Christian’s rural Kansan roots. (Julie grew up about an hour and a half drive west of Kansas City.) The walnut countertops in the bathrooms came from a tree Julie’s grandfather cut down; the lumber for the entry bridge leading to the front was sourced from Christian’s family’s farm; and the boys’ bedroom sports an orange barnlike door. The Arnolds look back on the nearly yearlong construction period with a kind of romanticism, remembering long days when Jack and James scrambled around in the dirt until they fell asleep, exhausted. The Midwestern winter posed some chal-lenges along the way. “There were some horrible days when my hands froze before I could get any nails in,” Christian recalls. But for the most part, the going was smooth. Now they’ve been settled in long enough to watch the leaves change into fiery fall colors, drop in winter, then come back to spring greenness, all framed by the windows and cast in shadows on the walls like a portrait of the seasons. It’s a cycle they’d like to repeat for many years to come. “I never want to move,” Julie says. But the Arnold family has grown by one since moving in, and their three-bedroom house could become a little too cozy. Fortunately, Christian isn’t daunted by the thought of starting again. “I like projects,” he says. Another eccentric patch of land could be waiting.